EMBODYING EMOTIONS: Modern health care and you! Modern health care and you! Mrs. Shah, a school teacher and mother of two teenagers has been diagnosed with stones in the gall bladder (cholelithiasis) . The doctor advised her surgery. Surgery? asks an anxious Mrs.Shah. I can't take a months break to undergo surgery, its just impossible! My job is demanding and who will look after my family? She continues helplessly. The doctor smiles and explains her about the latest 'Laparoscopic surgery'. Also called band-aid surgery/minimally invasive/keyhole surgery.In this abdominal operations are performed through small incisions which reduces pain and bleeding. A week later not only has Mrs. Shah got rid of her stones but is also carrying off her daily chores with ease and health. No doubt modern health care has arrived as a boon in today's health conscious yet extremely busy and nerve wrecking competitive scenario. 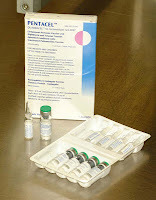 Many like Mrs. Shah have been befitted by techniques like endoscopy and laparoscopy whether it be for gall stones or hernia's. Take another case of Mr. Singh. He was diagnosed with Diabetes Mellitus about 3 years back.His work demands regular visits abroad. In such a situation it was extremely difficult to keep a check on his fluctuating blood sugar levels but thanks to portable blood sugar monitoring devices popularly known as 'Glucometer' testing is a just a minute away. All they require is a needle prick and the meter displays your sugar level. Very similar pocket size devices are available to keep a tab on your blood pressure and other vitals levels too. 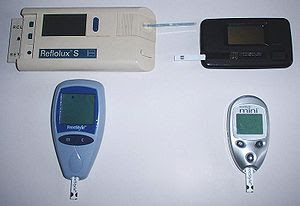 Four generations of blood glucose meter, c. 1993-2005. Sample sizes vary from 30 to 0.3 μl. (modern meters typically provide results in 5 seconds). Technology undoubtedly, has been the greatest invention of our century. It has bridged connections and made not just communication but over all life easier and very comfortable. 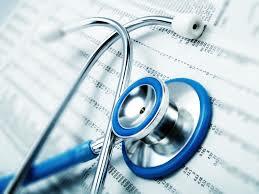 Our health sector has experienced a tremendous bloom owing to technology. 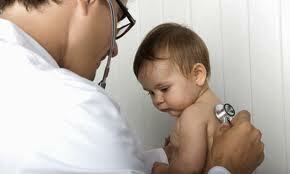 Being a medical student I very well understand the worth of a life, the cost of every single breath. Thanks to well equipped modern emergency ambulances also known as 'hospital on wheels' the cost of life elevates many notches up. They have all the basic life supporting systems installed in them. For an accident victim or a heart attack patient those few deciding minutes are in our hands now. Now imagine if at the age of 75 you have all your check ups and vitals monitored without you moving from the bed? No worries of going to the hospital or tolerating the traffic and noises? you ask me if it is really possible and I say yes! All praises to 'Tele medicine'. 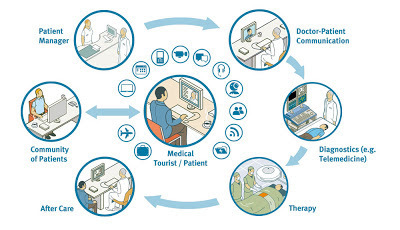 It is the use of telephones in place of health care devices inside a patients home. This is indeed a great tool for patients who need proper health care but cannot manage to come to hospitals or clinics. What used to be the most painful part during growing up? And we all would say in a chorus its injections! They have been dreaded by children and parents alike. But with the advent of new 5-in-1 vaccines called 'pentacel' which inoculates against diphtheria,tetanus, whooping cough, hepatitis B and polio all at once! So visit to the doctor gets pain free now. Our medical infrastructure has been growing by leaps and bounds. The technology used in our country is at par with the developed countries like U.K. and USA but all cost effective. 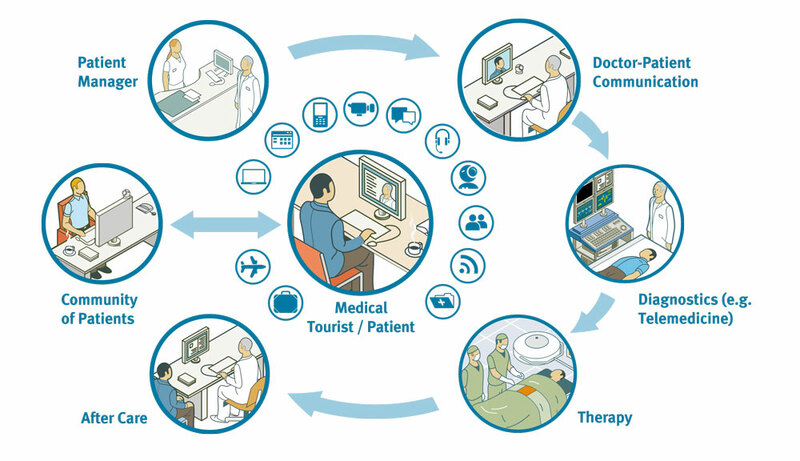 So its not surprising that medical tourism is a blooming sector of our health care today. 'Medical tourism' is basically travelling abroad for medical purpose in order to obtain a relatively cheap treatment than one's home land. India has now become a hub from patients coming from Africa and other countries especially for heart surgeries,hip replacements and cosmetic corrections. Heart surgery reminds me of someone called Mr.Anand. At 60 he suffered a massive heart attack. The doctors called it as 'coronary artery disease' which is basically narrowing or hardening of arteries due to excessive cholesterol levels. Mr. Anand has lost almost all hopes of life when 'Coronary stenting' came as a bright ray of life. 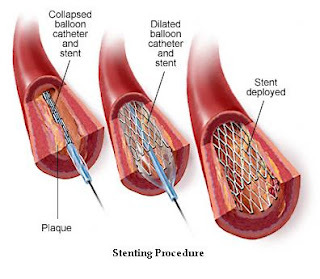 It is the placement for a small wire mesh tube called a stent to help the artery open and decrease the chance of it narrowing again. Stenting is combined with 'angioplasty' sometimes. The health care continues to make advancements every second. Robotic surgery, stem cell technology gene sequencing, uncountable investigative techniques like CT-scan, D & C, MRI that continues to get better, cataract surgery, bypass, organ transplants and grafting and collaboration with IT are only a few names. All we need is a better connectivity with the population residing in less developed areas and cost effective techniques. Once we are able to amalgamate modern health care with a practical reach and connectivity we would have accomplished one of the greatest achievements history has seen or will ever see! Fortunately with hospitals like Apollo on the frontier it sure will touch not just skies but a million lives year after year! For more details, developments and what Apollo has to offer, check this-apollohospitals. hehe..true! 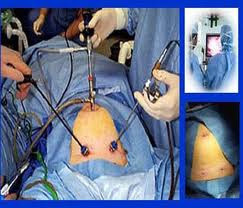 And laparoscopy and seriously made stone surgery very hassle and pain free. same happened with my mom! doctor se full on informational post hi expect kiya tha...:D..nice one..
Best of luck Sarah. That was a very comprehensive informative post. First time here and loved the post!